This was another one of the things we made during our cooking demo at Macy’s. I love the combination of sweet and spicy in the quick marinade. We used an indoor grill pan for the class, and while the skewers were very tasty, I must say I prefer them on an outdoor grill where you get a little more of that smoky flavor. 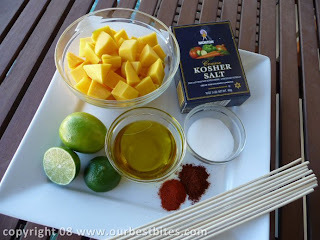 Either way, the mangoes will caramelize with their natural sugars and become extra sweet. Paired with a tender chicken bite, it’s divine! Make sure to use slightly firm (but still ripe) mangoes for these, or they’ll turn to mush on your grill. Also cut your mango pieces the same size, or even a little larger than your chicken (if you can) since the chicken will take a little longer to cook. These are great served as a meal with lime-cilantro rice or sweet and savory coconut rice. After grilling, try them on toothpicks for an appetizer! If you’re using wooden/bamboo skewers, make sure to soak them in water for 20-30 minutes before you use them. Otherwise they’ll fire right up on the grill! coat with marinade. Cover and refrigerate for 2-4 hours. the pieces and dividing them evenly. *When you’re making any type of skewer, make sure not to smash everything together tightly. In order for the food to cook thoroughly and evenly, it needs room! The pieces threaded on should just barely touch each other, or not touch at all. Serve immediately. This makes quite a few skewers, but remember that each one only has a few chunks of chicken on it. So to make a meal, you’ll want to plan on 3-4 skewers per person, making this recipe serve 4. However, if you have a lot of other things served with it, you could easily get away with 2 skewers per person and serve 6. In a large bowl, whisk together the olive oil, lime juice, lime zest, chili powder, cayenne, salt and sugar. Place in a zip-lock bag and add the chicken and mangoes, stirring gently to coat with marinade. Cover and refrigerate for 2-4 hours. 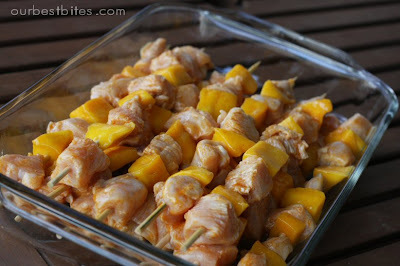 Remove the chicken and mangoes from the marinade and thread onto skewers, alternating the pieces and dividing them evenly. 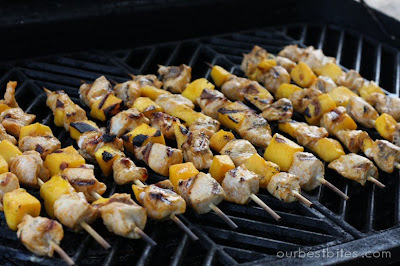 Arrange the skewers on the grill and cook, turning until the chicken is nicely charred and cooked through, 6-10 minutes. Serve immediately. This makes quite a few skewers, but remember that each one only has a few chunks of chicken on it. So to make a meal, you’ll want to plan on 3-4 skewers per person, making this recipe serve 4. Happy Birthday to the man who makes it all possible………….I am going to make this tonight…can’t wait to taste it. Sara- this looks delicious, as always! And I love how Eric always leaves such funny comments. Maybe he should start a blog of his own…I would read it. Happy Birthday Eric! This recipe really does look scrumptious (funny word, but very descriptive)! Happy Birthday Eric! Keep Sara churning out the goods! This sounds seriously good! 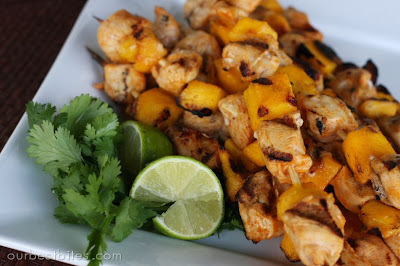 Chili, lime and mango on a stick with some chicken, mmm mmm good! HAPPY BIRTHDAY ERIC!!! I hope it is filled with quiet happy children and good food!! I have not tried the recipe, but it looks great and I can not wait to try it. I do not know you and I do not know your husband, but I want to wish him a belated HAPPY BIRTHDAY! Thank you for supporting your wife, we love what she does. Happy Birthday! I read about this blog and have really been enjoying it the last few days. Thanks for the great ideas and instruction. We will definitely be trying these! Happy Birthday, Eric! You are one lucky man. I love all things mango, so these are definitely on the must-try list. Happy Birthday you old man!! How does it feel to be 28?. . . I guess I’ll know in a few days huh?! Happy Birthday Mr. Behind the Scenes Man! Happy birthday, Eric!! I hope Sara made you something delicious and that you had a fabulous birthday! Happy Birthday Eric!! You are incredibly lucky to be able to try all this first hand, you are one well fed hubby! (and her amazing food) with the rest of us! I’m off to buy some mangoes! We tried the chili-lime sauce last weekend with bbq-ed chicken thighs and shrimp. It was delish! Thanks for all the great recipes. We’re in Okinawa, Japan, so in case you didn’t know yet, you’re international! Happy Birthday Eric, you have great ideas! I have been planning all week to make these tonight-I just found out our grill is out of propane! Please tell me I can put these in the oven and not screw them up too badly?! What temp? How long? Help! That looks really good! Adding the mango to the skewer is a great idea! Made these tonight – amazing! I marinated red & yellow peppers, onions, and baby potatoes (pre-bolied) and grilled veggie kabobs to go with these. SUPER tasty. Thanks! Here in TX we eat mangoes sliced with lime juice, chili powder sprinkled on it. So I can just imagine how this chicken must taste, delcious! Do you have a suggestion for this dish in the early Spring? Sorry, I mean, what would you serve as a side? Um, yes please. Cant wait to make it! I hope the marinade turns out without sugar added. One of my favorites from your site. Yum!! This was a great recipe! Made it for dinner today. I did think it needed a bit more salt, but other than that, perfecto! Can these be baked in the oven? If so, on a rack (?) and at what temperature and for how long? Made this recipe for an island themed party I had. I swapped out fresh pineapple for mango though and marinated it for about 5 hours. It was DELICIOUS! They went very quickly! They had just enough spice and were so tender. I made these last night, so amazing! I added some orange and yellow peppers, some cherry tomatoes and some red potato…so good, thank your for all your great recipes! So happy to have found your site! My first baby is due in 2 weeks and I want to stock my freezer with your wonderful recipes. For those who asked about doing these skewers in the oven, I have done similar skewers in the past under the broiler (use a broiler pan) with excellent results. Just cook for a few minutes on each side until meat is cooked through.